I came across the 43 things website after doing a search on why people would want to buy art. I haven't looked at the answers properly yet, but it just occured to me ... I should ask you! Would you buy original art? And, if so, why? Email me or comment me if you have a minute and if you're so inclined. Thank you. ...spend all my time surfing the interwebbythingy. It's along the lines of lists, but it's a survey of things people want to do with their lives. Then you can dig deeper and see what individuals are planning and what their next steps are. I LOVE this website!!!! I LOVE lists ... my own and other people's. Can you believe they get together and read lists out loud????? How COOL is that!!! My typin's going all to pot ... I'm far too excited. "... Dan Pink (Free Agent Nation) is working on a new book titled A Whole New Mind (coming in February from Riverhead Books) and one of his points is that the M.F.A. (Master of Fine Arts) is the new M.B.A. People who are learning the design technologies are the ones who will be creating the visual images (thus stories) of our culture." Went to two good shows at the weekend. The first was a new gallery opening in PONTYCLUN (where I grew up … a one-horse town … where they still have horses lol). It’s a house that has been converted into a gallery. It has gifts and crafts on the ground floor and an exhibition space upstairs. It’s very well done and I hope they are successful. It’s not positioned where they’ll get a lot of passing trade, so you HAVE to go and visit if you’re in the area. Funnily enough, I’d recently been thinking I’d like to exhibit in the area I grew up in (and still visit a lot) but there was nowhere suitable. So now … who knows? Secondly, I went to the opening of the Winter Exhibition at St. David’s Hall in Cardiff. It was a bit too much to take in on one visit so I’ll go back and mooch around when it’s a bit quieter. A few very nice pieces there though. All good for arts in Wales. I've added a new link on my sidebar to Birch Studio ... yet another blog I've started. Birch Studio is the "commercial" side of what I do (and intend to do). It will provide a forum for ideas and interaction, for marketing and promotion, for mentoring and training. All stuff that I've done for many years - working in a corporate context, running a small business, and freelance. Over the last 10 years it has become increasingly accepted that the arts play an important role in the economic life of the country and in the regeneration of communities. Yet still so many of us as artists struggle to find a voice and a place where our skills and creativity can be taken more seriously and put to a wider use. Well, this is the first challenge then, eh? To exercise a bit of creativity and see if we can gather some information and come up with some ideas that will start to change things ... for ourselves and for others. ‘Garwnant’ is a picture I produced earlier in the year. It’s 9ins. by 9 ins. 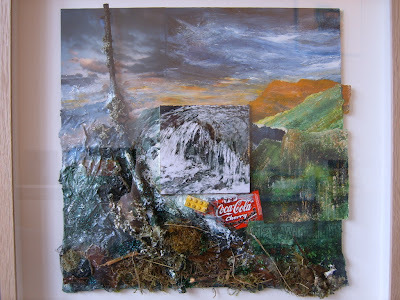 (unframed) and is made of paper, acrylic paint, photograph, collage and found elements (sticks, leaves, grass, moss, a Cherry Cola label and a Lego brick) on MDF. It’s framed in a 1.5 inch oak box frame. In material terms, the frame is worth more than the picture. Much more. Garwnant (the place) is a picnic area run by the Forestry Commission in the Brecon Beacons in Mid Wales. The Beacons are astonishingly beautiful, in a bleak kind of way. Garwnant, on the other hand, is non-descript … you could be any where. Picnic tables, a few walks, a cafe and toilets. And a car park. You stop there to go somewhere else. I went there many times earlier in the year, initially because it was convenient to stop there, but also because it had many of the elements I like … sticks, leaves, grass, moss and water (there’s a small river running through it). The water became the focal point for me. I’ve got a ‘thing’ about water and have had for some time. I took lots of photos of the water and made lots of sketches. I also fell in a few times. I was not the only one (nods at Jo). Back in the studio I’ve worked up those photos and sketches into a portfolio of drawings, which I’m particularly pleased with. The photo at the centre of ‘Garwnant’ (the picture … do try to keep up!) has been cropped so that it’s almost an abstract of water. It’s not meant to be a scene. You can’t point at it and say “Ooh, I’ve been there”. It’s an image of the element taken out of its context. (OK, that sounded geeky). The photo is surrounded by the detritus of nature and people’s interaction with it. Again, I haven’t attempted to depict a scene (I’m not a landscape artist, in that sense) but to pick up (literally) some of the bits and pieces that nature is made up of. (I prefer to think of it as ‘creation’ … which is a pretty massive clue as to what this is really all about). I love trees – and I draw them a lot – but I also love sticks, pieces of bark, moss, clumps of grass and handfuls of dirt. And they’re easier to bring home in the boot of the car. I love to take all these ‘found elements’ cover them in paint and glue, gold leaf, beads, whatever, and stick them into a picture. They are the odds and ends of nature that are often overlooked because everyone is looking at ‘the magnificent view’ (a bit like you and me, really … oops! another clue!). The Coke label and the Lego brick? Both are plastic and not biodegradable. They won’t grow or change or have seasons. They are incongruous and say something about our worst kind of interaction with nature and the evidence we leave of our being here. It would have been ‘nice’ to edit them out rather than include them, but by being there they have something to add to the conversation … and the meaning. Frankly, though, this picture is a bit of a mess. Bordering on chaos. The edges are not straight. The shapes, the textures, the colours, the composition don’t harmonise well. It’s not idyllic, but it’s what is really there. And how it really is. But it is a milestone in my artist’s journey. Garwnant – both the picture and the place – have established themselves in my mind as a focus of what I’m working with at the moment and what I’m about as an artist. It’s also my highest priced picture to date at £750 in the gallery (considerably cheaper if sold privately). My "Garwnant" picture is in an open exhibition at the ArtMatters gallery in West Wales. This quote, by David Hockney, has been very directional for me for many years. Time to bring it front and centre again, methinks! "There's something I want you to do"
"I want you to live your life out loud"
The first month of the Celtic year is “seed fall” – which I find inspiring. What’s been has been and now it is time to sow seeds for the future … to “sow where you want to go”. In that spirit, I’m planning over the next few weeks to sow some seeds. To begin with, I’ve produced a new promotional pack about my work as a visual artist. The idea is to give it and send it to as many people, galleries and organisations as I can. It contains photos of pieces that represent the different aspects of my portfolio as well as a bit about me. If you would like a copy, to see what I’m up to, then email me your address (if I don’t have it already … obviously) and I will send one to you (overseas included). My main aims now are to develop some strategic connections that will help with the ‘business’ side of what I do (promotion, logistics etc) as well as some financial resources to enable me to develop my work further. I feel that I’ve come a long way and I have a portfolio of work that I’m happy with. But now I’m looking out for connections that will lead to conversations that will lead to collaborations. I want to increasingly develop my artistic vision and output but not be restricted by what I can manage alone. For this I need ‘partnerships’ of an informal kind, but effective and productive nevertheless.